Janco Product and Service Offerings - All of Janco's products help Chief Information Officers (CIOs) and IT Managers to better manage and guide their enterprises. Click on any item and you will directed to a page describing the products along with links to see a copy of the table of contents, sample page, and a link to the ordering page. Once your order is processed you will be emailed instructions on how to download it. IT Infrastructure Policies - Detail procedures which can easily be implemented in enterprises of all sizes. eReader - Electronic Books - Ability to widely distribute to mobile devices including smartphones and tablets. 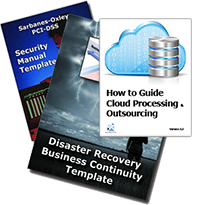 Great for Disaster Recovery and Business Continuity processes. Once any of our products is delivered we provide an automatic three months of update service. In addition, one year or two years of update service can be acquired. If a product is purchased via a re-seller, the customer may or may not get this updated depending on the re-seller providing us with the customer's contact information. This is important since we review all of our offerings at least once every six months or when there is a new issue (such as new compliance requirements or advance in technology). If any of our offerings are impacted we do update our product, automatically provided a download to our subscribers as well as notifying all purchasers of the impacted product. In addition we typically also issue a press release highlighting the change.